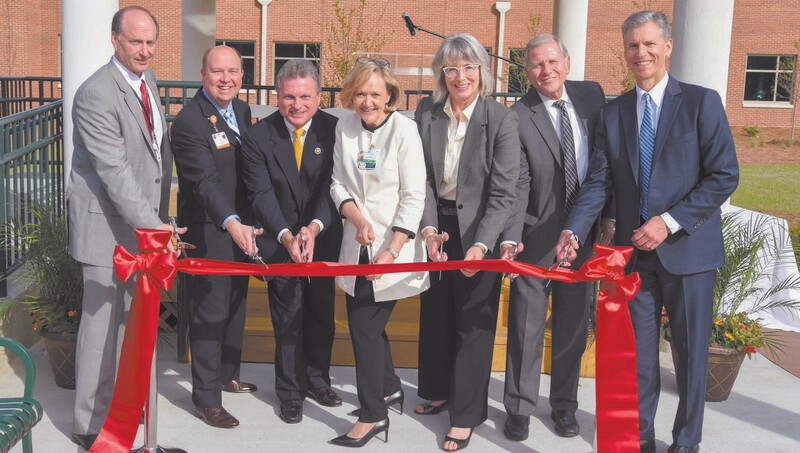 A community grand opening ceremony for the Rehabilitation Hospital of Savannah, an affiliate of HealthSouth, was held yesterday Tuesday, March 29, at 6510 Seawright Drive. More than 300 individuals were in attendance to celebrate the hospital’s opening. In addition to hospital tours and the ribbon cutting ceremony, attendees heard remarks from Kathy Kleinsteuber, chief executive officer of the Rehabilitation Hospital of Savannah; Mark Tarr, executive vice president and chief operating officer of HealthSouth Corporation; Bill Lee, senior vice president and chief strategy officer of Memorial Health; and Congressman Buddy Carter. “This new hospital is a great addition to the continuum of medical care in the Savannah community as the region’s only freestanding inpatient rehabilitation hospital. Rehabilitation Hospital of Savannah begins serving patients on Friday, April 1, at the new location and offers 50 all-private rooms, a spacious on-site therapy gym to patients who have experienced stroke, trauma, brain and orthopedic injuries, as well as other major illnesses or injuries.